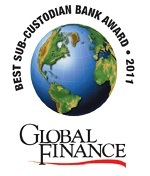 NEW YORK, May 16, 2011 – Global Finance magazine has released its eighth annual ranking of the “Best Sub-Custodians.” This exclusive survey will be published in the July/August issue. Global Finance editors and reporters, with input from expert sources, selected the winners from the institutions that reliably provide the best custody services in local markets and regions to global custodians. Our criteria included customer relations, quality of service, competitive pricing, smooth handling of exception items, technology platforms, post-settlement operations, business continuity plans and knowledge of local regulations and practices.